Formally the French Roast Cafe' ... We have changed our name to better reflect our international dining experience. The same exceptional cuisine prepared by Owner Chef Haong Lee, always with the freshest of ingredients. Makes the Saigon Paris Bistro among the finest of Fort Myers Restaurants. A premier dining experience in an elegant setting. 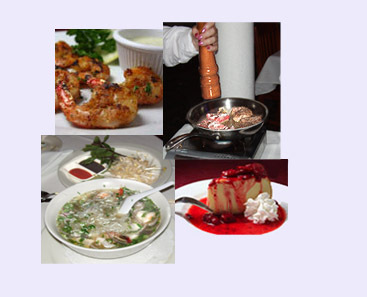 Enjoy the finest in French and Vietnamese Cuisine. Reservations are not required but recommended. Voted 4 Star Dining (February of 2010 by) - Jean Le Boeuf the nom de plume of a local food lover who dines at The News-Press' expense. Voted number one formal dining restaurant in Fort Myers by web review online blog. Experience the best, freshest food for a unique dining experience you won't find anywhere else in a Fort Myers Restaurant. We are located next to at the Bell Tower and behind Outback on Route 41 Cleveland Avenue in Fort Myers Florida. - a Local Fort Myers Restaurant. Monday - Saturday 2-for-1 Breakfast Special Morning 9 -11:30am. Pinebrook Park Plaza 12995 Cleveland Ave.